Ankara (AFP) – President Recep Tayyip Erdogan on Monday vowed that Turkey would not take any step back in its operation against Kurdish militia in Syria’s Afrin region, saying the campaign had the backing of Moscow. “We are determined. Afrin will be sorted out. We will take no step back. We spoke about this with our Russian friends. We have an agreement,” Erdogan told a televised meeting in Ankara. 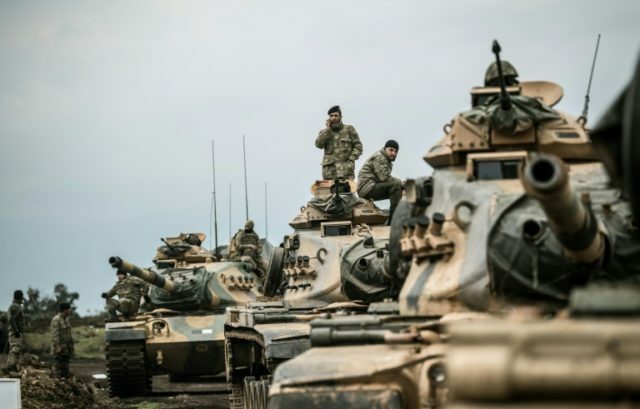 The Turkish military on Saturday launched operation “Olive Branch”, its second major incursion into Syrian territory during the seven-year civil war. The operation, where Turkish war planes and artillery are backing a major ground incursion launched with Ankara-backed Syrian rebels and Turkish tanks, aims to oust the People’s Protection Units (YPG) militia from its enclave of Afrin. A green light from Russia, which has a military presence in northern Syria, is seen as crucial in ensuring the operation is a success. Moscow has not confirmed the existence of such an agreement. Erdogan confirmed that Turkey had spoken with other powers, including the United States, about the operation but admitted “we couldn’t convince the US on some things.” He did not give further details. “We as Turkey have no intention to occupy anywhere. We have one single goal — to win hearts,” said Erdogan. He expressed impatience with demands, including from some officials in Washington, to set a clear timetable for the length of the operation. “How long have you been in Afghanistan? Is that over in Iraq?” he said, referring to the current US military presence in those countries which began with 2001 and 2003 invasions.